The best ads either tell stories that are both universal and unique, provoke conversation, and/or engage and educate customers in authentic and useful ways. It takes a combination of outstanding creative, use of emerging technologies, and keen insight into user behavior and emotion. We compiled a list of the best ads of 2018 (so far!) that do this and more. To mark the 30th anniversary of its iconic “Just Do It” slogan, Nike teamed up with former 49er Colin Kaepernick and other remarkable athletes like Serena Williams and LeBron James. The focus on Colin Kaepernick elevates the slogan to timely and provocative levels: taking a stand, just doing something, even if it means sacrificing something. Nike took a stand on an issue at the risk of its own brand showing that it itself could “Just do it”. This for sure is one of the best ads of 2018, and even perhaps the last decade. Home Depot blended social media and a novel use of interactive 360° photo to launch its Built In Pins campaign. Adweek called it a cutting-edge campaign of the year as part of its Project Isaac awards. Did you know Land O’Lakes is a member-owned agricultural cooperative? Did you know that of the co-op’s 1,791 farmers, 30% are female? With Land O’Lakes’ She-I-O campaign, audiences see these farmers against a new musical rendering of the popular “Old MacDonald Had a Farm” nursery rhyme. When Paramount Pictures launched their campaign to promote the July release of the latest Mission: Impossible film, they turned to emerging technologies like 360° VR to make it happen. Their ads feature a 360° VR video of Tom Cruise performing a remarkable helicopter stunt with exclusive behind the scenes footage. For a thrilling film like Mission: Impossible – Fallout, an immersive experience was the perfect medium to convey the dangers and excitement of the film’s action sequences. Los Angeles clothing brand Everybody.World wanted to emphasize its sustainable approach to clothing and promote its Trash Tee, a 100% recycled cotton shirt. To do this, the brand and its production team Mixed Business created a fully recycled video. Using old stock footage, vintage Kodak film, and even old voiceovers. It’s a gimmick but an effective and hugely creative one. For this year’s Super Bowl, Tide’s creative campaign forced viewers to question whether every day they saw was a Tide ad by putting out a car ad, a beer ad, a deodorant ad, etc—all ultimately pitching Tide. 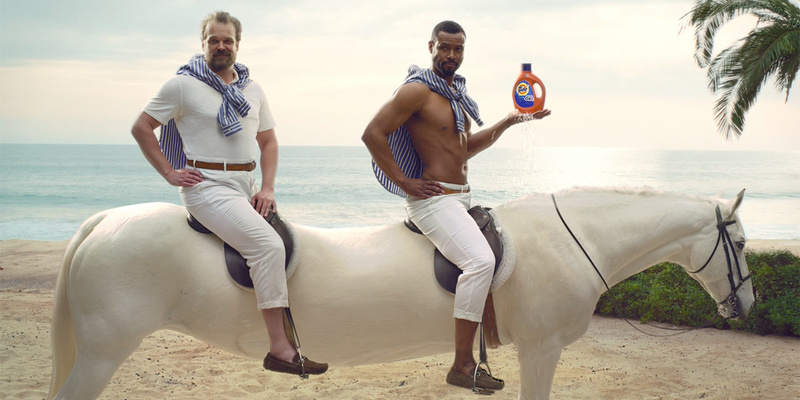 The campaign massively placed Tide as THE brand on everyone’s mind during the Super Bowl–that’s a lot of minds thinking about a top brand.